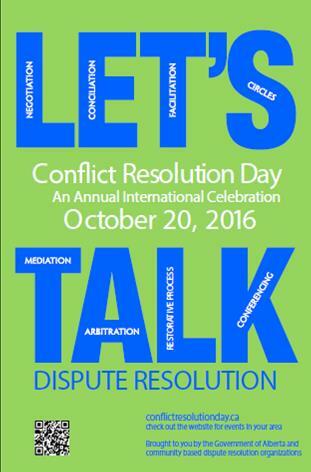 There were 10 events held across the province in 2016 to celebrate Conflict Resolution Day. A total of 97 individuals participated in 6 workshops held in 5 locations - Calgary, Edmonton, Grande Prairie, Medicine Hat, and Strathcona County. This year the planning committee hosted its first ADR Information Fair in Edmonton; a showcase of ADR services and providers for Albertans. The event held in downtown Edmonton attracted many members of the public to learn more about ADR and its many benefits. Participant feedback about the events overall were that the workshop was very relevant and helpful to both their personal and professional lives. The most consistent theme for where improvements could be made was that participants wanted more time for learning and role plays. A list of events and workshops that occurred are listed below. Details: Come out for appetizers, drinks, and door prizes and connect with your colleagues in ADR! This is a FREE networking event. No pre-registration is required. Charitable donations for community mediation will be accepted at the door on behalf of the Mediation & Restorative Justice Centre. Details: We invite you to watch "Screenagers", a documentary of how screen time affects brain development. This award-winning movie aims to increase awareness and is recommended for parents, teenagers, educators and anyone else interested in the effects of using smartphones and computers in our daily lives. A Q&A with two knowledgeable Mental Health Professionals will take place after the screening. Popcorn to be provided. Details: Most people have a hard time responding to personal attacks in emails, texts and other communications. Learn four easy steps to bring an angry exchange to a quick conclusion without losing it yourself. Join us for a hands-on workshop and learn how to manage hostile communications. Details: Conflict Resolution Day Planning Committee members will showcase their services, provide information on the benefits of ADR, and assist individuals with how to access ADR resources in their community, within government or when engaging a private ADR professional. Location: Grande Prairie Courthouse (Mediation Room) and Lions Learning Centre for the lunch-hour presentation. Event Description: Attend our workshop and learn the methods and skills to help you constructively navigate through communications that have a hostile tone. The 9:30 and 3:30 events are being held at the courthouse. The 12 noon event is open to the public, includes a light lunch and and will be held at the Lions Learning Centre. Description: This year's topic focuses on managing hostile communication, in particular, written communications. The content is based on the work of Bill Eddy from the High Conflict Institute. ​Description: Join us for a hands-on workshop and learn how to manage hostile communications. Facilitated by Strathcona County Community Mediation volunteers. Bring your lunch! Description: Bringing awareness to Conflict Resolution Day to High School Students from Grade 9-12. Description: Zentangle - Yoga for the Mind! The Zentangle Method is an easy-to-learn, relaxing, and fun way to create beautiful images by drawing structured patterns. Description: Most people have a hard time responding to personal attacks in emails, texts and other communications. Learn four easy steps to bring an angry exchange to a quick conclusion without losing it yourself. Join us for a hands-on workshop and learn how to manage hostile communications.